ONEOK, Inc. (NYSE:OKE) investors should pay attention to a decrease in hedge fund sentiment recently. 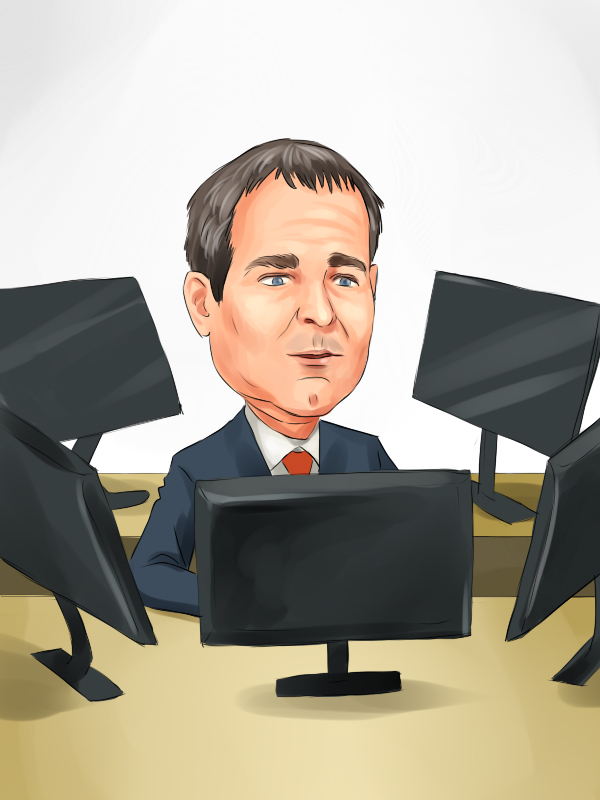 OKE was in 26 hedge funds’ portfolios at the end of the fourth quarter of 2018. 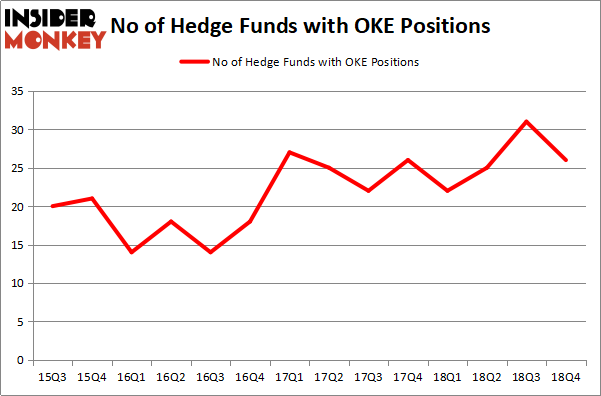 There were 31 hedge funds in our database with OKE holdings at the end of the previous quarter. Our calculations also showed that OKE isn’t among the 30 most popular stocks among hedge funds. Today there are tons of metrics investors can use to appraise stocks. A couple of the best metrics are hedge fund and insider trading moves. Our researchers have shown that, historically, those who follow the top picks of the top hedge fund managers can trounce the S&P 500 by a healthy amount (see the details here). We’re going to review the recent hedge fund action surrounding ONEOK, Inc. (NYSE:OKE). How have hedgies been trading ONEOK, Inc. (NYSE:OKE)? At the end of the fourth quarter, a total of 26 of the hedge funds tracked by Insider Monkey held long positions in this stock, a change of -16% from one quarter earlier. Below, you can check out the change in hedge fund sentiment towards OKE over the last 14 quarters. So, let’s find out which hedge funds were among the top holders of the stock and which hedge funds were making big moves. The largest stake in ONEOK, Inc. (NYSE:OKE) was held by Zimmer Partners, which reported holding $200.3 million worth of stock at the end of September. It was followed by Renaissance Technologies with a $89.7 million position. Other investors bullish on the company included D E Shaw, Citadel Investment Group, and Perella Weinberg Partners. Since ONEOK, Inc. (NYSE:OKE) has experienced bearish sentiment from hedge fund managers, logic holds that there were a few hedgies that decided to sell off their positions entirely last quarter. Intriguingly, Vince Maddi and Shawn Brennan’s SIR Capital Management said goodbye to the largest position of all the hedgies followed by Insider Monkey, totaling close to $34.1 million in stock, and Steve Cohen’s Point72 Asset Management was right behind this move, as the fund dumped about $10 million worth. These bearish behaviors are important to note, as total hedge fund interest dropped by 5 funds last quarter. Let’s also examine hedge fund activity in other stocks – not necessarily in the same industry as ONEOK, Inc. (NYSE:OKE) but similarly valued. We will take a look at Anadarko Petroleum Corporation (NYSE:APC), Digital Realty Trust, Inc. (NYSE:DLR), The Kroger Co. (NYSE:KR), and Twitter Inc (NYSE:TWTR). This group of stocks’ market caps match OKE’s market cap. As you can see these stocks had an average of 39.75 hedge funds with bullish positions and the average amount invested in these stocks was $1036 million. That figure was $471 million in OKE’s case. Anadarko Petroleum Corporation (NYSE:APC) is the most popular stock in this table. On the other hand Digital Realty Trust, Inc. (NYSE:DLR) is the least popular one with only 23 bullish hedge fund positions. ONEOK, Inc. (NYSE:OKE) is not the least popular stock in this group but hedge fund interest is still below average. Our calculations showed that top 15 most popular stocks among hedge funds returned 19.7% through March 15th and outperformed the S&P 500 ETF (SPY) by 6.6 percentage points. Only a few hedge funds were also right about betting on OKE as the stock returned 25.6% and outperformed the market by an even larger margin. Here is What Hedge Funds Think About BT Group plc (BT) Were Hedge Funds Right About Souring On Canon Inc. (NYSE:CAJ)? Hedge Funds Dropped The Ball On Fortive Corporation (FTV) Here is What Hedge Funds Think About AutoZone Inc. (AZO) Were Hedge Funds Right About Flocking Into Sempra Energy (SRE)? Is IQVIA Holdings, Inc. (IQV) A Good Stock To Buy?